I love nuts, and am always delighted to find new ways to use them, so when the good folks at California Walnuts sent along this recipe for Walnut Cluster Snack I immediately sensed something good. 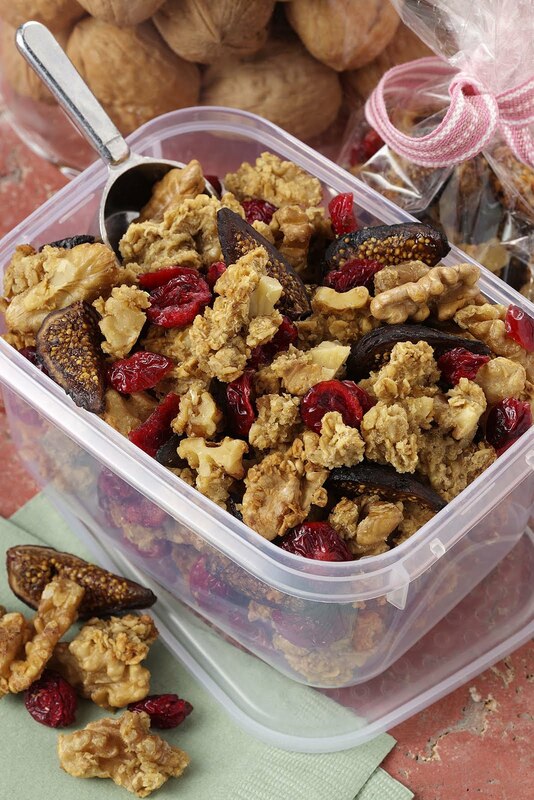 They describe them as "clusters of crunchy oats and walnuts baked with tender dried fruit." I'm not crazy about figs, so I'm going to try them with dates...I'll let you know how that turns out. (Also check out How to get a bikini body - 5 tips from fitness pro Petra Kolber that include motivational tips and info about the healthy properties of California Walnuts). Preheat the oven to 325°F. Lightly spray a 13 x 9 x 2-inch baking pan with vegetable oil spray. 1. In a large bowl, stir together the oats, oat bran, and walnuts. 2. In a medium bowl, beat the egg white until frothy. Stir in the apricot nectar, maple syrup, walnut oil, and vanilla. 3. Pour over the oat mixture, stirring until moistened. 4. Press the mixture into the prepared pan. Bake, uncovered, for 45 minutes. Put the pan on a cooling rack and let cool for 10 minutes. Break up the mixture into small pieces or clusters. Return the clusters to the pan. Bake for 10 minutes. Put the pan on a cooling rack. Stir in the figs and cranberries. Cool thoroughly. Store in an airtight container. To serve, put ½-cup portions in snack-size bags or foil muffin cups. Or, portion into decorative bags and tie with colorful ribbon for a healthy and tasty gift.